I'm not a candy blogger (nor am I a shrimp blogger), but a buddy of mine threw out a challenge to review what could have potentially been a match made in heaven, Pretzel M&M's (if you think I'm improperly using that apostrophe, look at the packaging). Unfortunately, Mars came up short. 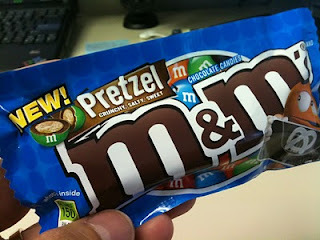 While the idea of salty and sweet is as old as last night's Lost characters, a ball bearing-sized pretzel is just too small to strike the appropriate balance, and the attempt to give it any diameter whatsoever left little room for chocolate, especially after figuring in the thin candy shell. The sum was way less than the parts. Furthermore, there couldn't have been more than 10-12 candies in the package, so Josh, if you're reading this, I'd like the dollar back that I wasted trying these. Buen provecho. interesting! they sound like they'd be delicious. how disappointing.